Is the water industry controlled by the multinationals - or is this just the latest front in the anti-globalisation campaign? The authors of Thirst: fighting the corporate theft of our water (based on their 2004 film) do not hide whose side they are on. Multinational corporations, and the governments that support them, are the bad guys. Average citizens who fight the corporations are the good guys. The book documents what the authors see as an "epic power struggle, which will spread to every corner of North America in the coming decade". In many ways, it is intended as a call to arms because "today, water is where we are taking a stand on our basic values as individuals and on who we are as a society". If you find this perspective, and the strident language that goes with it, a bit hard to take, then this book is probably not for you. Yet it is an interesting read, well-written and thoroughly documented, and the text is complemented by 50 pages of careful notes and references that are helpful and informative. The book provides insights into what is a growing activist movement against private sector involvement, particularly that of multinationals, in the water sector. What it does not provide is a balanced argument. The fact that the private sector does not own the water, but manages water services for a fee, and is closely regulated by the government, is dismissed. The core of the book is formed by eight case studies in which US citizens have fought corporates, including RWE, Suez and Nestle, over the control of water. Interesting reading, but as always with a select set of case studies, are these the exceptions or the trend? The book makes no attempt to help us find out. What is noteworthy is what is left out. The authors vastly overrate the influence and importance of multinational corporations in the water sector. The real movers and shakers in the water world are governments. The fact is that, as the book concedes, "85% of Americans are presently served by the thousands of publicly owned and locally operated water systems". Around the world that percentage is probably higher. The few exceptions include the UK (where Margaret Thatcher privatised the water sector) and France (which has a long history of large, private water companies). By and large, governments have not done a terrific job of looking after their water systems. Badly operated, capital-starved public waterways in developing countries lose 30%-50% of their water through leaky pipes. Two billion people in the developing world lack access to safe and affordable drinking water. As a result, millions die every year from preventable diseases such as diarrhoea. This is the real water crisis. This dismal state of affairs is what prompted the involvement of the private sector in the late 1990s in a bid to improve water services. The World Bank did indeed advocate private-sector contracts, particularly for large cities in developing countries. For five or six years, from 1998 to 2003/4, a small number of multinationals from France and the UK signed a number of contracts for long-term water and sewer service management. The results were mixed at best, not so much due to popular uprisings, but because the companies underestimated the complexities of delivering the service and doing business far away from home. By 2006, the bubble had burst and the eagerness of the multinational companies to deliver water and sewer services in the developing world had diminished considerably. In countries such as the US, the problems are different. As the book notes, much of the infrastructure is old and needs replacing. This is not exactly breaking news, however. The sewer crisis has made headlines in public works journals for the past 25 years. It presents American taxpayers with a large and unattractive bill. No wonder governments are looking for cheaper options, providing an opening for the private sector if it promises to do a better job. Maybe in some cases it can. The bottom line, though, is that, public or private, it is the taxpayer who will end up paying for new sewers. The book did not convince me that corporations are taking control of our water, let alone stealing it. An interesting question is whether water is really different from any other commodity. Are people opposed to private sector water services because it is our "most necessary resource"? Or is water just the latest front in the anti-globalisation campaign? Sadly, this book does not answer these questions. 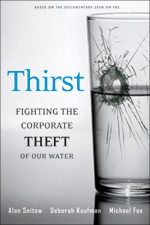 Thirst: fighting the corporate theft of our water, Alan Snitow, Deborah Kaufman and Michael Fox, Jossey-Bass, $27.95, ISBN: 0-78798-458-2. Frank Rijsberman is director general of the International Water Management Institute in Colombo, Sri Lanka.